White furniture in a living room can create space giving a relaxed and suits both contemporary and traditional styles resulting in a style that never dates. White furniture can complement any colour scheme and style. For an all white living room use different shades of white on the walls and for fabrics. Add depth and interest with bold wallpapers in neutral colours. With white furniture in your living room you can create a style to suit you. New England style is incredibly simple and this look will never go out of fashion. 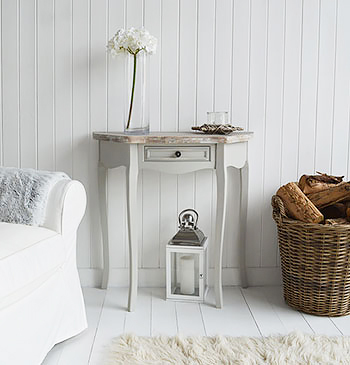 For a New England theme, paint the walls white or a pale blue with white paintwork. Panelling the walls gives a room lots of character, paint it white to create a fresh feeling. The thin vertical lines make the room appear taller by drawing the eyes upwards. New England style shutters are more expensive, but extremely practical and desirable and give a fantastic look. If you prefer the more traditional window dressings, white curtains and blinds are vital for rooms that lack natural light. Decorate the walls with beach themed pictures with a white frame. Even within the generic classic country style there are many different forms. Generally the classic country is to mix patterns by using bold prints on fabrics and plain sofas. The country style can also have a contemporary edge using bright bold fabrics in pins, orange and limes bring in slightly more contemporary sofas and chairs. Use this style with plain walls to avoid the feeling of overcrowding. Checks and stripes are a far less fussy option than the florals for a simpler scheme. If mixing stripes, plains and patterns keep the colour scheme simple to no more than 3 colours. Layering window dressings generates an intimate atmosphere. Plains and patterns give the best effect. Having an open fire is ideal for the country style living room, but this is not always possible with many living rooms not having a fireplace. Overcome this problem and create a focal point with a wood burning stove. White furniture for the contemporary home has the advantage of giving the room a classic feel instead of being faddish and will not date as it can go with all styles. Putting white furniture against white walls and a contrasting floor has a dramatic effect. Black is stylish and is easy to co-ordinate accessories with. Bright, bold colours also work well.